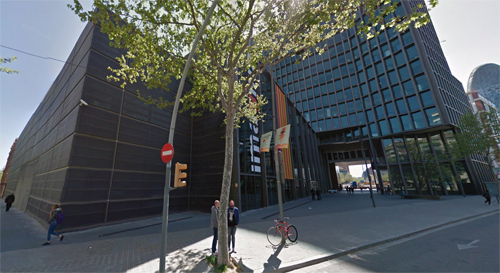 The building in this photo is the Mediapro Building on Audiovisual Campus. 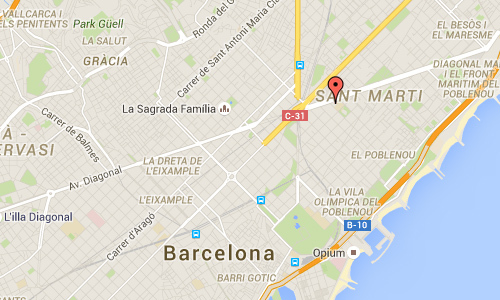 Mediapro is a multimedia communications group, located with it HQ at Avinguda Diagonal, 179, in Barcelona, Spain. Founded in 1994 in Barcelona, the company is involved in movie and television production, as well as media (Público and beIN Sports). MediaPro is based in Barcelona, with branch offices in Madrid, Seville, Girona, Lisbon, Madeira, Budapest, Miami, Porto, Qatar, Amsterdam and Tenerife. 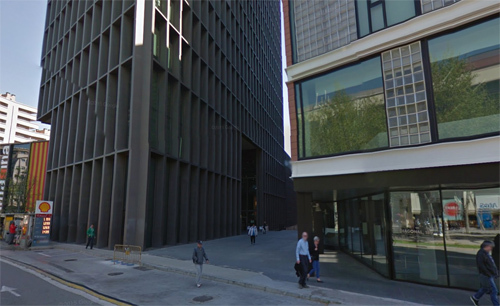 The Mediapro Building was created by OAB, Office of Architecture in Barcelona. 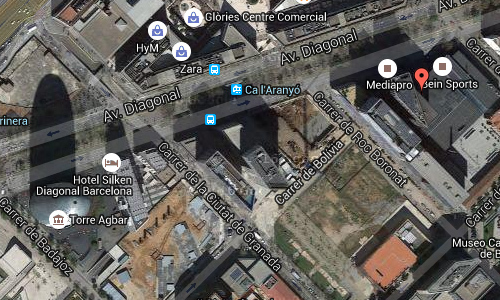 The building is the first piece in a sequence that culminates in the Agbar Tower. 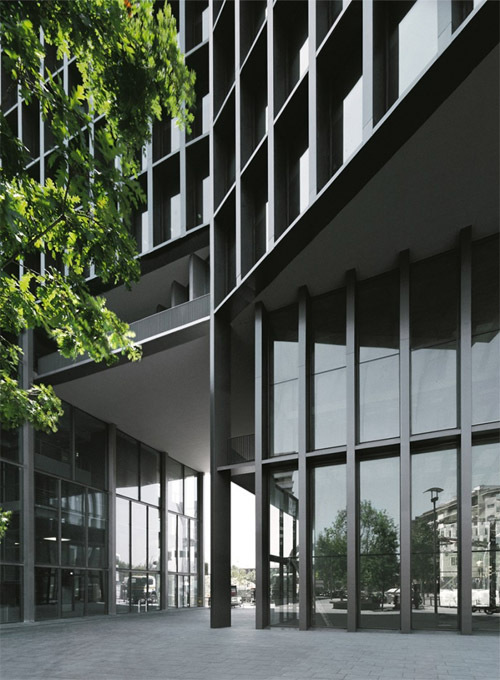 The end wall of the building pivots and is positioned front-on to the Diagonal, thus turning the casual look of the foreshortening into a respectful façade aligned with the wide avenue. The first four floors of the building are perforated to provide a conclusion to Calle Bolivia and to focus on the urban perspective. With the first displacement of its jut, the tower forms an arris that accords it tension and character. 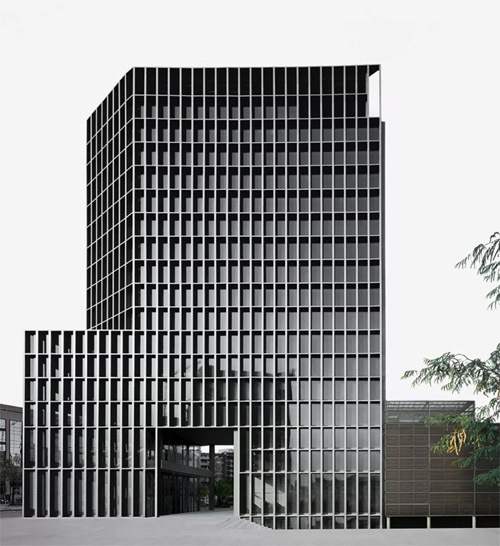 On a lower level, and coinciding with the plinth of the neighboring building, the tower redirects its alignment, generates a new plane, constructs the façade front-on to the Diagonal, and permits the sightlines of the adjacent building to open up. On its upper floors, the building seeks, on the diagonal, after the top arris of the tower, using its geometry to give it a sculptural dénouement, while the interaction of the two alignments generates a dynamic play of shadows. The low body or plinth penetrates beneath the tower and with its transparent façade gives rise to a new public space, a triangular piazza. Around it, the building is converted into a sculpture that is respectful and attentive towards the solicitations of the city. The office tower offers great flexibility of use, thanks to the non-existence of pillars or intermediary structures, thus leading to a series of diaphanous floors. A single, repeated window, unfolding continuously on all the façades, provides excellent illumination and views from anywhere in the tower, as well as great versatility in terms of the internal layout. The glass panes on the inside of the reticle are dazzle-free and protected from direct exposure to the sun, rain and dirt. 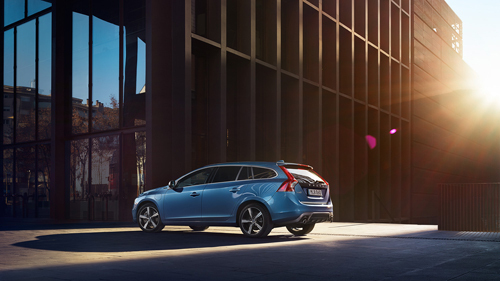 The varied layout of the different floors permits a certain functional specialization of the programs. The audiovisual production and teaching activity in the low body and the business management activities in the tower lead to programmatic unity. The structural skeleton is converted into the final shape of the building through arriving at a concordance between loadbearing structure and façade. The calculation of its finite elements has only been possible for a little over a decade. The fusion of a membrane or structural diaphragm with post-tensioned slabs leads to huge spans and also gives rigidity to the whole. The areas of the façade with less of a load help to support the major stresses of the more tensile parts of the reticle: this is “structural democracy.” The inner steel of a single element, a 0.70 by 0.30 cm pillar, has a variable section according to the amount of load it bears. At the same time its concrete fill gives it greater inertia in respect of fire. The great height of such pillars on the bottom floors and on the top one, devoted to installations, gives the building a classic shape. The reticle of pillars and the floor slabs permit the pillar/decking complex to be thought of as a series of huge Vierendeel girders. The framework, painted a steely bronze color, just like the fine metal frames of the windows that close off the recesses of the structure, nuances the different spans, giving the tower a sensitive, powerful look. With its huge segmented glass panes, the front wall of the plinth forms an urban façade and, thanks to its transparency, allows the life of the building and the movements of the public to be seen. 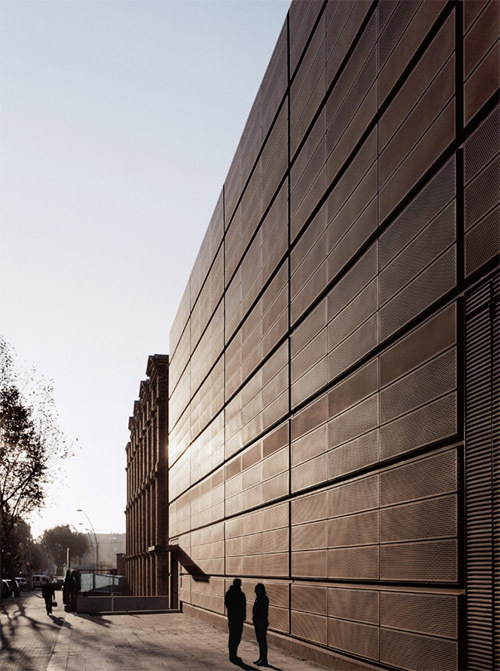 In the side street, the low body which is in alignment with the old factory is closed off with metal panels with varying degrees of perforation and more of a golden finish. 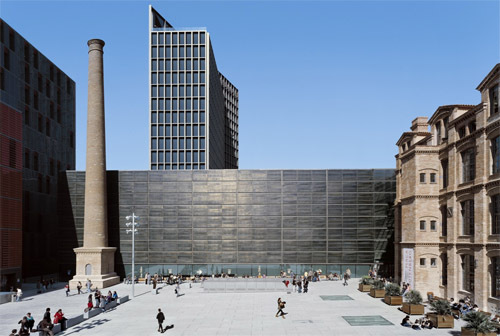 This presents an affable face to the city with the horizontal treatment of its different skins contrasting with the formal impact of the tower’s vertical structure. More information at wp.ferrater.com, www.mediapro.es and miesarch.com.